On Mahesh Bhatt's Birthday, Daughters Alia & Pooja Bhatt Announce Their Next Family Venture! Mahesh Bhatt has been known for his super hits in the 90s. He made his way into the 21st Century by directing and producing films like Aashiqui and Hamari Adhuri Kahani. After a long break, Mahesh Bhatt is back in the game with, Sadak. But, this time, it's a little extra special because he is casting his daughter, Alia Bhatt in it! Today (which is also Mahesh Bhatt's Birthday) Alia posted a trailer of the movie, thanking her dad for giving her the best return gift ever, by directing a movie with her in it. 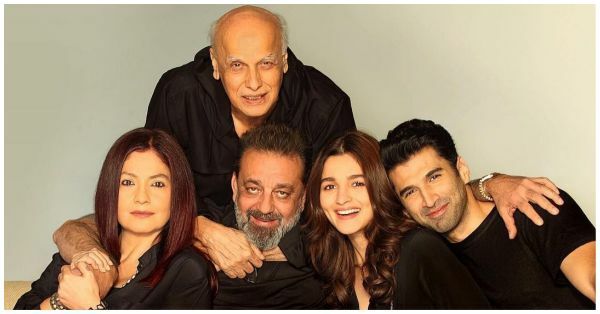 The older version of the movie featured Pooja Bhatt and Sanjay Dutt, the new on with have Alia and Aditya Roy Kapur. The cast of the movie sat down together for a cute portrait, which makes us feel like they're already like a movie-fam! Since it's Mahesh Bhatt's Birthday today Alia posted a heartwarming post for her father, thanking him for everything he's done for her. Sadak is set to release in 2020, which marks 29 years since the original movie came out in 1991. Pooja and Sanjay both tweeted about the movie as well, take a look. We can't wait for this power-packed movie, it will be super interesting to see the Bhatt fam-bam work together!